3D Printing in Automotive Market size was estimated to be over USD 1.4 billion in 2017 with the annual sales of over 110 thousand 3D printers. The market is anticipated to grow at a CAGR of more than 25% over the forecast timespan. The 3D printing in automotive market is propelled by the growing requirements in the automotive sector for cost-effective and efficient technology to develop high-quality and complex products. The technology has enabled the development of products, which were technically not feasible earlier with the traditional methods. The building mechanism of the additive manufacturing technology allows the freedom of design and enables the integration of internal components under previously inaccessible surfaces or parts. Furthermore, it enables manufacturers to combine parts for integrated functionality that will improve the performance and durability of the product while keeping the cost low. The decline in the price of the 3D printers is augmenting their demand in the market. 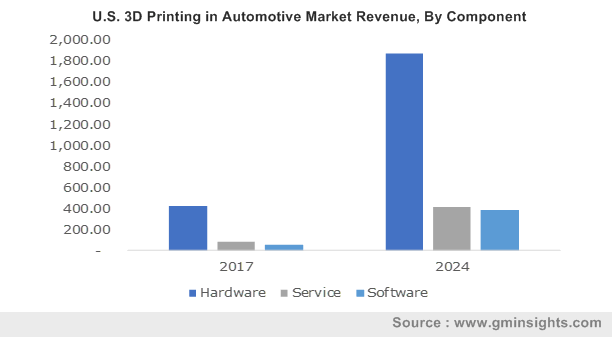 The technological advancement and fueling competition among the 3D printing in automotive market players to cater to the demand for the desktop printers are responsible for the decline in the prices of 3D printers. Earlier, the 3D printers were bifurcated into two categories, desktop printers costing below USD 5,000 and industrial printers costing over USD 5,000. However, over the past five years, the price brackets have changed significantly. The desktop printers are now priced as low as USD 700. This is encouraging the use of 3D printers in organizations. However, the limited build envelope of the existing additive manufacturing technology is the major restraint in 3D printing in automotive market. The technology is being primarily used to manufacture smaller parts due to the limitations in the powder bed diffusion technology used in metal printing. In addition, economies and scalability issues associated with the technology are also hindering the market growth. 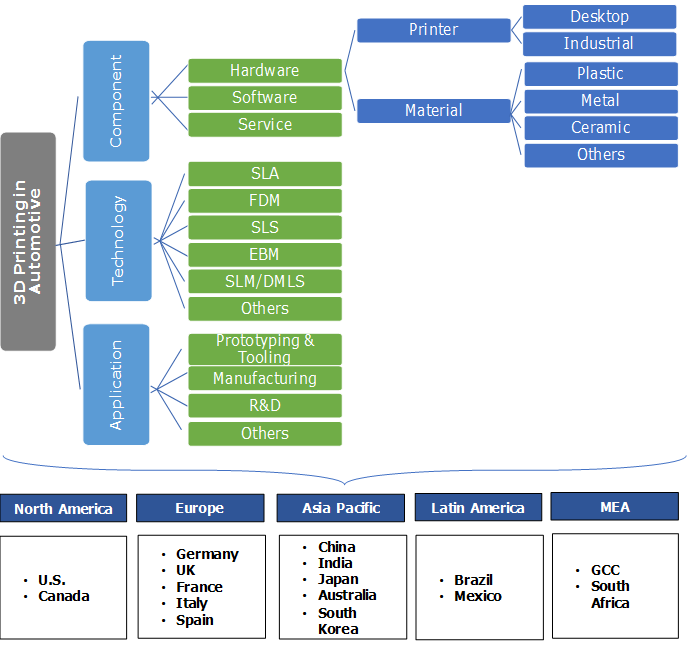 Hardware is leading the component landscape with over 75% share in the 3D printing in automotive market. The hardware market is driven by the growing sales of 3D printers across the globe. The manufacturing companies are leveraging on the capabilities of the 3D printers to accelerate their production and reduce the production cost. Materials also hold a significant share of the market. The surging demand for the manufacturing of functional products and the declining prices of printers and materials are changing the market structure and improving the revenue. The software market is estimated to grow substantially at the CAGR of over 30% during the forecast period. The 3D printing in automotive market is driven by the emergence of third-party developers in metal 3D printing software. The third-party software developers are revolutionizing the market by providing integrated tools designed to reduce the current process chain. Moreover, the major companies providing traditional 3D CAD solutions are offering open source solutions to optimize the printing process by eliminating the need for in-between tools. The services market is expected to grow at a CAGR of 25% over the forecast timespan due to the growth of on-demand manufacturing services. The increasing trend of mass customization in the automotive market has nurtured the growth of on-demand manufacturing services with a rise in Manufacturing as a Service (MaaS). The Fused Deposition Modeling (FDM) technology accounts for more than 50% stake in the 3D printing in automotive market. The market is attributed to advancements in the composite materials used in FDM processes. Its ability to print larger parts at higher deposition rates has encouraged multiple companies to conduct R&D activities to improve the mechanical attributes of the FDM parts. The Selective Laser Melting (SLM)/ Direct Metal Laser Sintering (DMLS) technology is projected to grow at a CAGR of over 32% over the forecast period. The technology is anticipated to gain momentum as it offers higher detail resolution due to the use of thinner layers and enables the development of more intricate part shapes. Furthermore, the compatibility of the technology with a wide range of materials, such as alloy, steel, bronze, aluminum, cobalt-chrome, and titanium, further augment the demand for the technology among the manufacturers. Prototyping & tooling is the prominent application of 3D printing in the automotive market with a share of over 60% in 2017. The technology allows automobile engineers and designers to conduct more revisions in less time, which effectively reduces the time to market. Moreover, it reduces the cost of prototyping by eliminating the tooling costs since the designers use the same equipment to print multiple models rather than purchasing specialized tooling & bits needed for subtractive manufacturing. It also allows prototypes to be produced quickly with fewer resources than it would require for manufacturing through traditional methodologies. The technology enables automobile manufacturers and designers to compress the product development cycle. It reduces the lead time of the tooling production to enable quick updates with the existing equipment. It also allows the automotive companies to afford frequent tooling replacements. This lets the equipment design systems to keep up with the product design cycles. North America is dominating the 3D printing in automotive market with a share of more than 45% in 2017. The growth is attributed to the high R&D spending by public and private sector organizations. The government in the region is also working with private establishments & academic institutions to promote the use of additive manufacturing technologies among manufacturers. In addition, the technology was predominantly developed in the region due to the existence of numerous providers of 3D printing services such as 3D Systems and Stratasys. Europe 3D printing in automotive market is anticipated to demonstrate a stable growth with the CAGR of 25.8% during the forecast timeline. The market is propelled by the increasing number of government initiatives and Public-Private Partnerships (PPP) aimed at advancing the additive manufacturing technology in the automotive market. For instance, the EU has launched a new framework program to enhance research investments in the additive manufacturing technology. The region is a major player in the 3D printing ecosystem due to the presence of various companies providing additive machines for the fabrication of metallic parts sold across the world. The expertise of these companies & research centers has made the continent a major pole of attraction for investments. The key vendors of 3D printing in the automotive market are 3D Systems, Autodesk, Stratasys, Arcam, Voxeljet AG, Exone, Hoganas AB, Ponoko Ltd., Hanhook Tires, and AI Design. These players are adopting partnerships and collaboration strategies to attain inorganic growth and gain a market share. For instance, in 2018 SLM Solutions & EOS partnered with Audi to implement 3D printing technology in its automobile manufacturing facility. The partnership is aimed at developing a new product folio and gain an edge over its competitors. Furthermore, it will provide the companies with an edge over major 2D printer vendors. The 3D printing industry has remained nascent but has shown rapid growth over the last decade. The companies operating in the market have attracted robust investment activities to capitalize on the untapped & expansive market opportunities. However, the market share concentration is low compared to the traditional manufacturing market in the automotive sector. The technological advancements in the 3D printing technology over the last decade have changed the ways in which products are manufactured, developed, designed, and distributed. For the automotive sector, 3D printing has resulted in newer designs, lighter, cleaner & safer products, and shorter lead times & lower costs. While the original equipment manufacturers and suppliers mainly use 3D printing technology for prototyping & tooling, the technology also has a huge potential for a wide range of new applications in product innovations and high-volume direct productions. The new advancements in 3D printing along with its related fields such as composite materials will assist the automotive industry.